The Saxons present their lifestyle concept for the third time in a row. Based on a study by the Zukunftsinstitut, they focused on “the customer of tomorrow” with all his wishes and needs. In 9 scenarios, different lifestyles are staged in a realistic way. “Under the motto “Reflecting on lifestyles”, we have expanded our concept in three directions. We consider not only the kitchen, but also the entire living space; secondly, we have developed our furniture range in a targeted manner and we have given thought to the implementation of the concept in the retail sector,” says Managing Director Elko Beeg. The Saxons prove this with a 90 sqm single apartment, which is presented as a “holistic living concept”. In 2016, there were nearly 17 million single-person households. More than half of the people in major cities such as Berlin or Hamburg live without roommates. A large part of them are between 30 and 50 years old and have consciously chosen this way of life. Single households often differ from multi-person households in that they have an even more open residential structure. A harmonious furnishing concept is of particular importance here. “The kitchen is the new living room,” says Elko Beeg on a tour through Vincent’s apartment, the brand-conscious real estate agent. 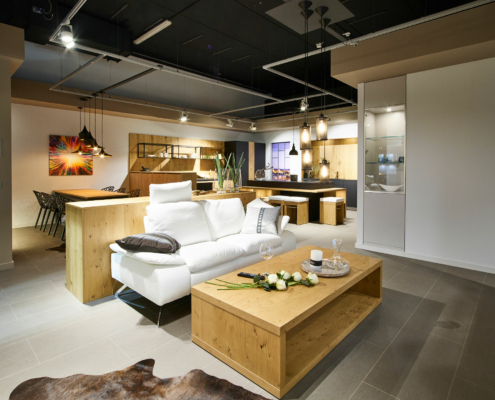 The elegant living area made of matt black FENIX and natural oak veneer combined with the indirect lighting is very inviting and cosy. The large combined kitchen and living room offers not only a lot of storage space, but also enough space for Vincent’s friends, who like to “gaze” at him while cooking. For the larger “cooking events” there is a long dining table and if this is not enough, the coffee table with its well-matched colours is also used. In the open living area, the play of colours changes to a modern white matt lacquer. Oak remains the connecting element. The sleeping area is only separated by a high living element and forms a room with sufficient peace and intimacy. 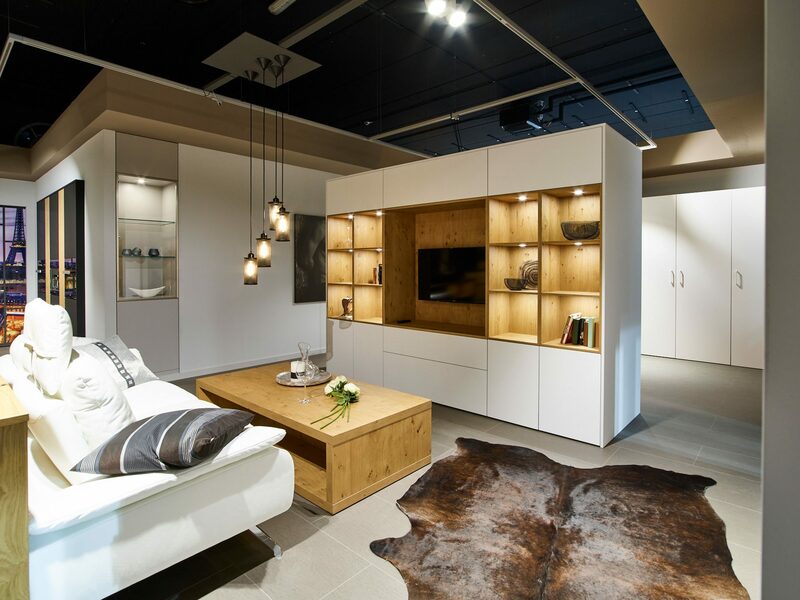 Behind the large white doors, in addition to the wardrobes, there is also a small workstation, which can be easily integrated into the room thanks to the sliding doors. The finale is a fully equipped utility room and a large wardrobe in the hallway of the apartment with softly closing folding doors. These elements are also based on the grid system from Sachsenküchen and can be planned and installed without any problems. 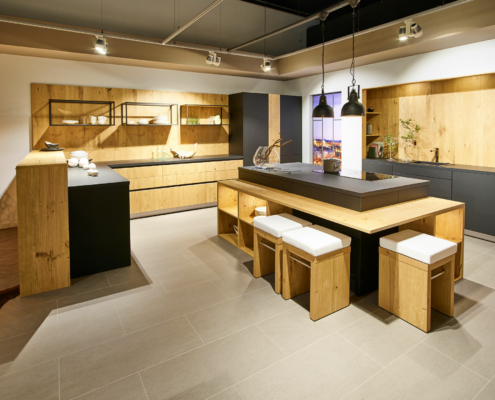 “The cooking and living area presented here consists exclusively of catalogue elements and can be realized by any studio. 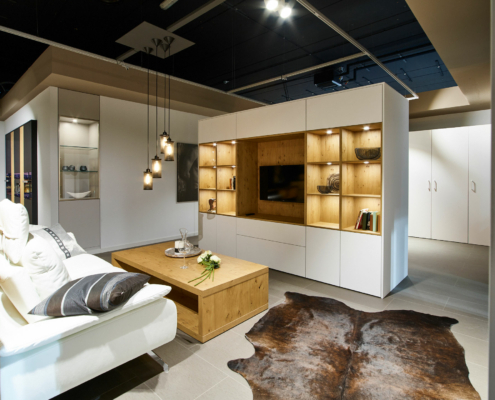 If the boundaries between rooms disappear, then the furnishing concepts must also make their contribution,” says Elko Beeg. 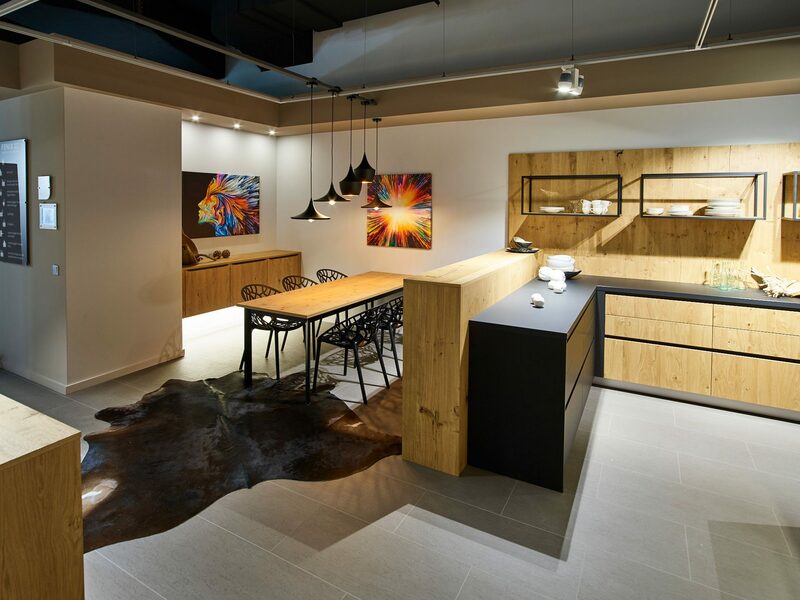 Vincent’s apartment is just one example of lifestyle-oriented living concepts. The Saxons present 8 more ideas for network families, superdaddys, mentors and trainees on an exhibition area of almost 500 sqm. 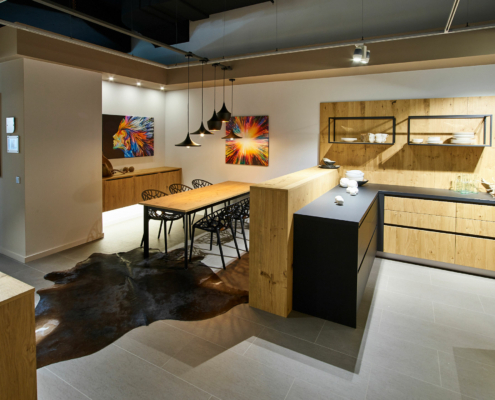 For the latter lifestyle group, a concept was developed which is characterised by solitary furniture and is therefore also “relocation-friendly”. The innovative highlight is a hidden hob, which, in addition to an ergonomic hob lowering, offers an additional working and preparation area of 90 cm width. Of course, there are also a number of new models in Saxony. 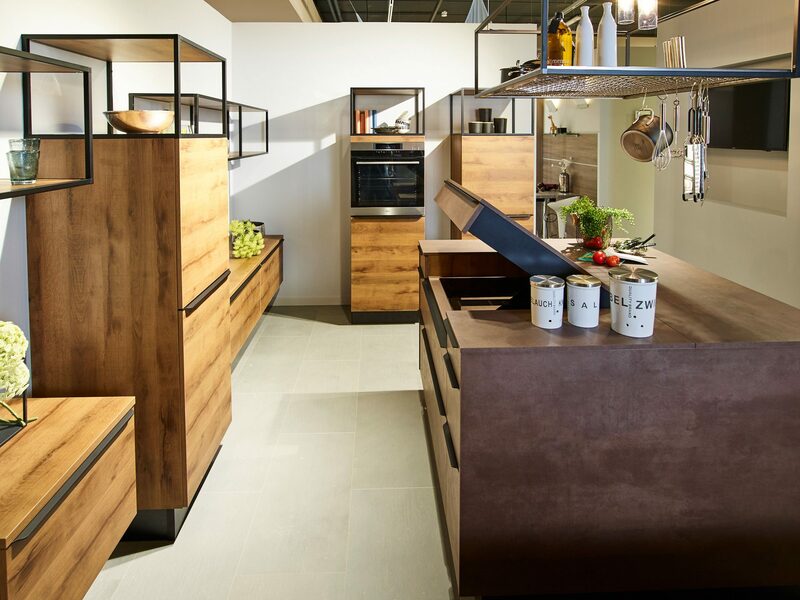 These include fronts and worktops made of FENIX nanotechnology material as well as fronts made of ultra-matt lacquer with antifingerprint effect. 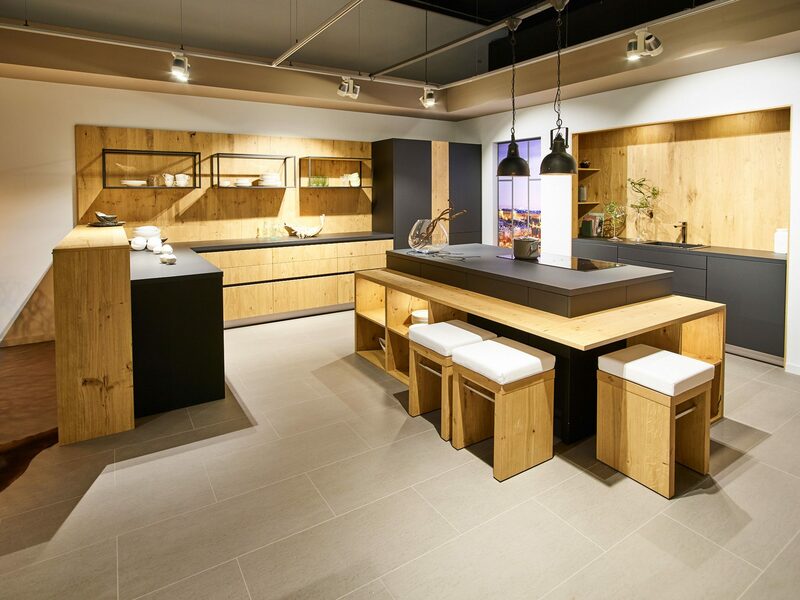 The carcases with identical interior/exterior decor, Sachsenküchen is known for, have been extended to include the wood decor Chalet Oak nature as well as a matt black. In keeping with the theme of “black”, the range also includes matching black anodised handle bars, recessed grips, aluminium framed doors and table frames. These form an interesting family with a lot of creative potential. In the area of special fittings, the range of “large doors” is extended by a passage door fitting, a folding door fitting and a pocket door fitting. 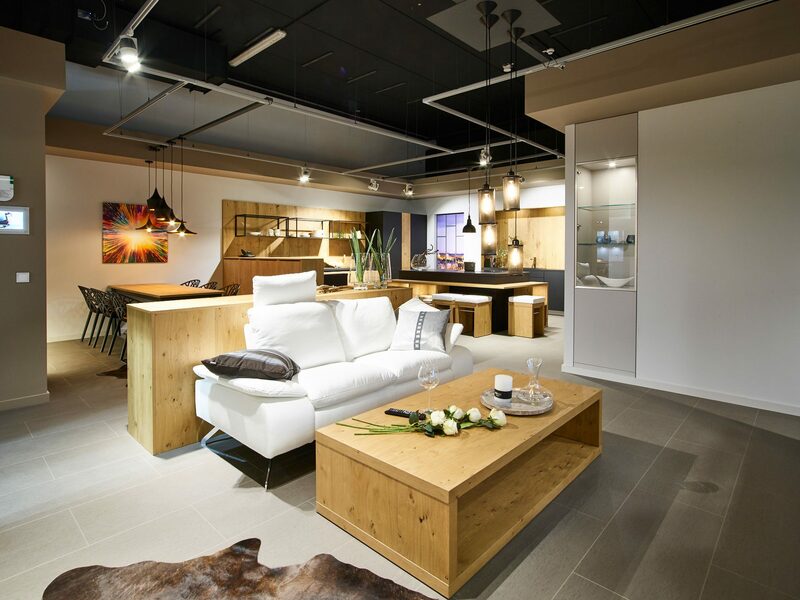 “These fittings are an excellent addition to open-plan living concepts,” says Elko Beeg.